Aztecs forward Skylar Spencer goes up for a shot against San Jose State. SAN JOSE, Calif. (AP) As poorly as San Diego State shot in the first half, the seventh-ranked Aztecs remained in control against San Jose State because of their usual lockdown defense. When that defense started to create easy baskets, San Diego State was on its way to a blowout. Xavier Thames scored 15 points and No. 7 San Diego State used a pair of 16-point runs in the second half to extend the second-longest winning streak in school history to 16 games with a 75-50 victory Wednesday night. Josh Davis added 10 points and 12 rebounds in his 12th straight double-figure rebound game. Winston Shepard and Skylar Spencer scored 12 apiece for the Aztecs (17-1, 6-0 Mountain West), who won their first six conference games for the first time since starting 7-0 in the California Collegiate Athletic Association in 1966-67. The Aztecs, off to their best start since winning their first 20 games three years ago, broke the game open by scoring 16 straight points before and after a San Jose State basket early in the second half. The first run started when JJ O’Brien scored on a layup and drew the fifth foul from Isaac Thornton with 17:14 to play. Thames hit a 3-pointer later to make it 44-30 before the Aztecs turned the game into a dunk fest. 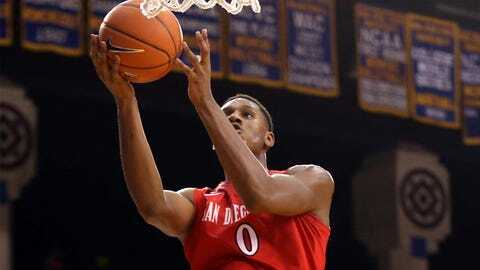 Dwayne Polee added a dunk following a missed free throw and the Aztecs used their defense to finish the spurt. Thames stole the ball from Jalen James and fed Shepard for a dunk to give San Diego State a 19-point lead. Polee followed with a steal and jam that made it 51-30. Following a jumper by Devante Wilson, the Aztecs scored 16 more in a row to make it 67-32 and send the Spartans to their seventh straight loss. Wilson scored 14 points and James added 10 for the Spartans (6-13, 0-7), who have lost 20 straight games against ranked teams since beating Alabama 60-59 in overtime on Dec. 27, 1996. The Aztecs entered the game ranked first in the nation in field goal defense (35.4 percent) and second in scoring defense (55.7 points per game) and were even stingier than usual against the Spartans. They held their 12th opponent under 40 percent shooting and gave up fewer than 60 points for the 10th time this season to win a road game while shooting 39.3 percent and making just two baskets outside the paint all night. The teams combined to miss the first 12 shots of the game before Davis scored on a drive to get San Diego State on the board. Davis was fouled on the play but missed the free throw in a sign of how much the offenses would struggle. The Aztecs put together an 8-0 burst midway through the half with a pair of three-point plays by Thames to take a 13-5 lead, and they remained ahead the rest of the way. Spencer scored on a putback dunk and a lob pass from Shepard in the final minutes of the half to give the Aztecs a 29-19 lead at the break despite shooting just 29 percent. The Spartans were held to a season low for points in the first half and missed 23 of 29 shots. This was the first meeting between the Cal State schools since the Aztecs left the WAC following the 1998-99 season. The game attracted a crowd of 4,117 that was the biggest since at least 2002 for the Spartans, who last hosted a ranked team in 2007 and hadn’t played a top 10 team at home since losing 88-64 to then-No. 1 UNLV on Jan. 31, 1991.